Monday morning Alabama greetings to one and all! Well, it sure has been a couple of crazy weeks since you’ve last heard from us! Busy? Yes, indeed! I was up in Canada on a shoot for ten days and it was interesting to say the least! This past week I spent most of the week working on all the video and still photography from the Canada gig and was able to get things wrapped up on Friday afternoon and was darn happy about that! We had one night to regroup and left for Alabama on Saturday and here we are ready to rock once again for another gig! I’m amazed at the amount of time that we have spent on the road this year and it’s far from over!!!! We’ll rock and roll this week and then I think we’ll be in Peoria the rest of August and I’m not too upset about that at all!!!! On our road trip out West in late June for another gig, we had a couple of days for ourselves to get out and shoot and a few weeks ago you saw a couple of photos from Badlands National Park in South Dakota. This week I’ve got a couple of photos from Devils Tower National Monument in Wyoming. For those of you that have never been there, you might have seen the tower in the 1977 movie “Close encounters of the Third Kind”. It’s one of those things that you can see for miles as you are driving too, it doesn’t seem all that big until you get closer and closer and see that it’s pretty darn big! You also can see why many Native Americans in the area hold this tower as being a sacred place. I can feel that vibe when I’m there because there aren’t any other formations like that in the area, so I can see why it’s a special place! 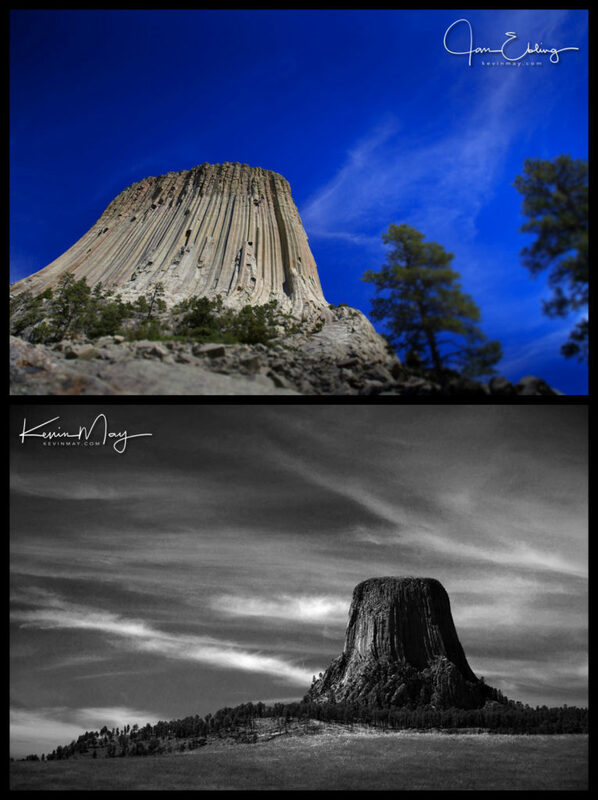 Here’s a couple of our snaps from Devils Tower National Monument. Ok, it’s time for us to get rocking! We’ve got a busy week and then back to Peoria, so we’ve got to get going! We hope that you’re going to have a great week to come and thanks for checking out our work as always!!! Well the short work week of the 4th of July holiday weekend has come and gone and so has the three-day work week. I’m telling you I could get used to working only three days a week! I’m sure by the end of this week we’ll all be ready for the weekend and a couple of days off! On our road trip out West a couple of weeks ago, we were able to spend a day at Badlands National Park in South Dakota. It’s a very fascinating place and if you’ve never been there for a visit, it’s well worth your time to spot in and check it out. Before you get to the park, the area around the park is a very open grassland and flat as it can be. When you get to the park the landscape turns into a mini Grand Canyon with some incredible formations. One of the things that I like is that you can start at one end of the park and drive through to the other end on the scenic drive. There are lots of places for you to pull out and take some photos and see the scenery. I think we’ve got a couple of great photos to share this week from Badlands National Park. We were incredibly fortunate to see a number of Big Horn sheep and thanks to a long lens, Jan was able to get a really wonderful shot of one of these magnificent animals! They are so big and when you see them up close, you wouldn’t want to be in range of those horns because I’m sure they could do some serious damage. I was able to grab a nice shot of the landscape and also was fortunate to have some very nice clouds in my snap and that made the photo even better! 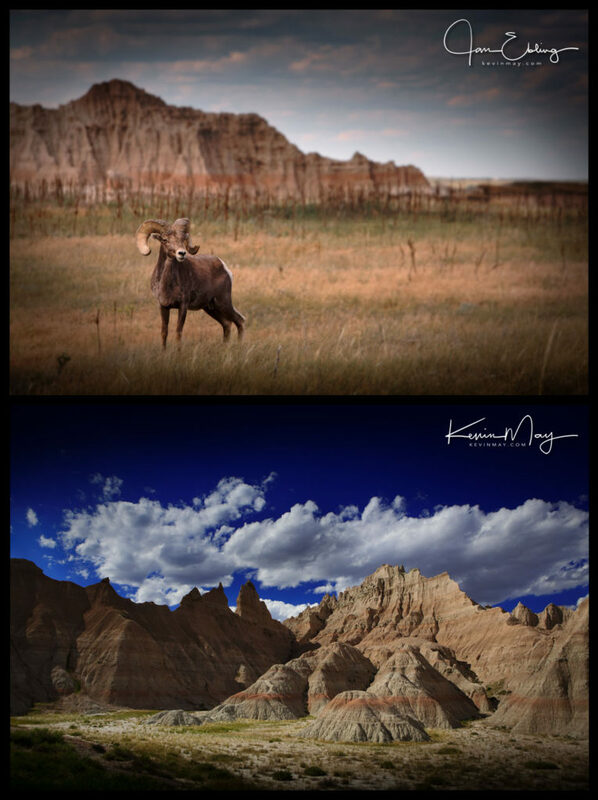 Here’s our two snaps from Badlands National Park. Thank you as always for taking the time to check out or work and we hope that you have a great week to come!!! Wednesday morning Peoria greetings to one and all! We had a shoot in Ft. Collins, Co. last week and it’s always great for us to get out West like that. It’s never too upsetting to be out West in the summertime with your eyes on the Rocky Mountains and the lower humidity that we sure don’t have here in Central Illinois in July. We had a great shoot and then we were able to spend a couple of days in the Denver area for ourselves. The weather couldn’t have been more perfect and we were able to get out and take some photos as well and that’s never a bad thing! 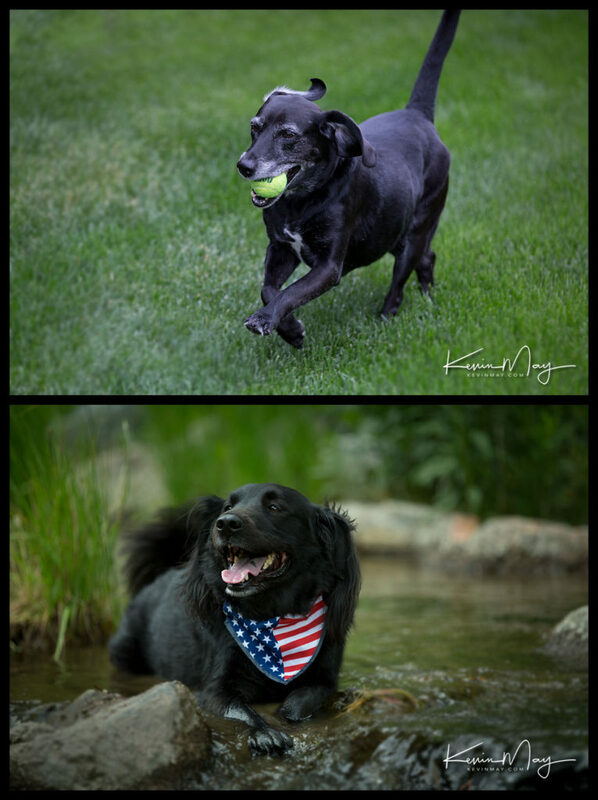 One of the fun things that we got to shoot were a couple of furry four-legged friends that were out enjoying a very nice day! I think that the dogs were enjoying the day as much as we were! Here’s a couple of my snaps from a dog day afternoon spent with Chu-Chu and Dublin. It’s time to get to work! It’s going to be a busy week getting caught up from being on the road and we’ve got three days to do that! We hope that you have a great rest of the week and thanks again for checking out our work!